It’s been over a year in the making with Disney officially acquiring 20th Century Fox at midnight tonight, and one person in particular marked the occasion on Twitter. 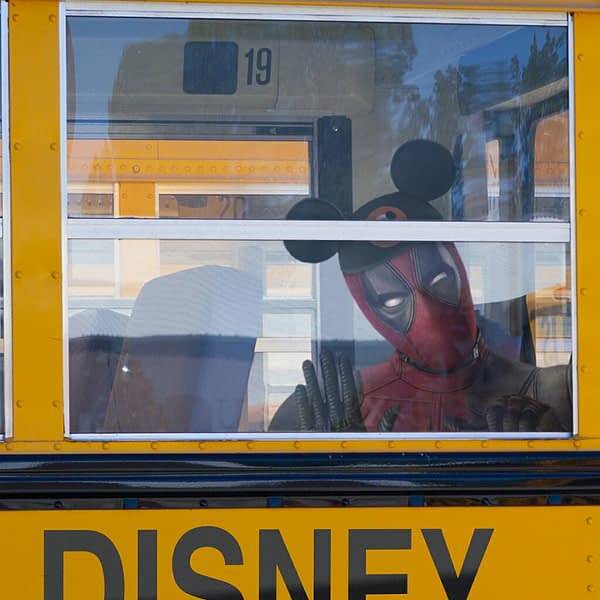 Deadpool star Ryan Reynolds tweeted, “Feels like the first day of ‘Pool” inside a Disney-branded school bus, wearing the trademark mouse ears cap, hands pressed against the window and head slightly titled to one side. In an unprecedented move on Christmas 2018, Fox released Once Upon a Deadpool, a PG-13 version of Deadpool 2, released earlier in the year. With the film cleaned up significantly and more content added including Fred Savage parodying his role 30 years ago in The Princess Bride, it showed a willingness for Reynolds and the creative team to play “ball” with Disney should the deal finalize. While there are no details about Phase IV of the Marvel Cinematic Universe, the possible inclusion of Fox’s X-Men Cinematic Universe could be explained once Avengers: Endgame hits theaters, April 26th. Dark Phoenix will be the final Fox X-Men film set to release June 7th, 2019. Do you see Marvel Studios retain anything with the transitioning? Will we see another X-Men reboot or just recast? Will Reynolds be allowed to pick up where he left off for X-Force? Would Spider-Man: Far from Home and Black Panther 2 make any mention of “mutants?” Sound off.